In wood turning I try to be a good steward of the earth. Most of my turnings are made from salvaged wood, trees that have died or been removed, furniture industry scrap, or firewood. This wood would otherwise be converted to wood chips, land filled, or burned. My turnings are labeled by species when possible. To not contribute to the indiscriminate destruction of forest and habitat and the importation of tropical woods and other exotics, I prefer to use native species. So often wood’s beauty has been locked inside and that determines the final product. 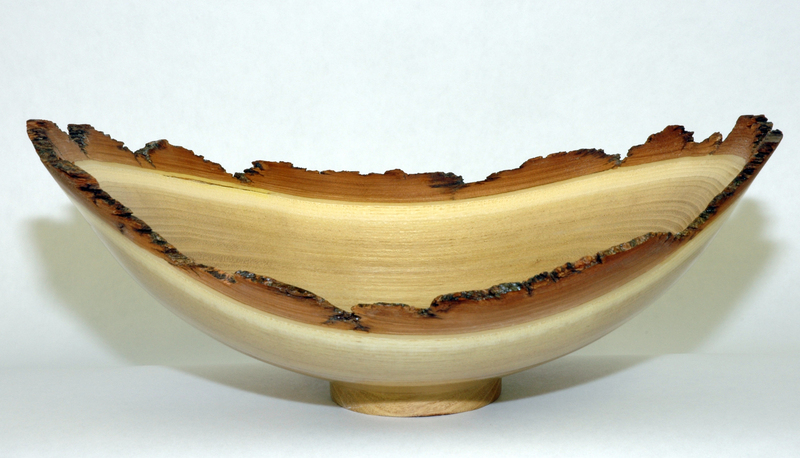 Rather than destroy an interesting grain pattern, I‘ll make something that captures that beauty. Gnarly bark, knots, and other inclusions are kept to accent the piece. My turnings range from unique Christmas tree ornaments, bowls, platters, turned boxes, candle holders, oil lamps, small wood toy tops, snowmen, and Christmas trees, to bud and weed vases and turned wood jewelry. Also comfortable creating using antique printing presses that I have saved from the iron mongers, I created a collection of note cards. They are printed with my original wood engravings, lino cuts by family artisans, found images, and antique cuts. The wood engravings are made using antique tools and archaic methods. I also scan old images; clean them up on computer, and then email the file to a firm that still makes etched “cuts” in copper. The cut is set up on the press and I hand feed each card to receive the imprint. For the writer’s enjoyment I strive to find paper that has a good writing feel.